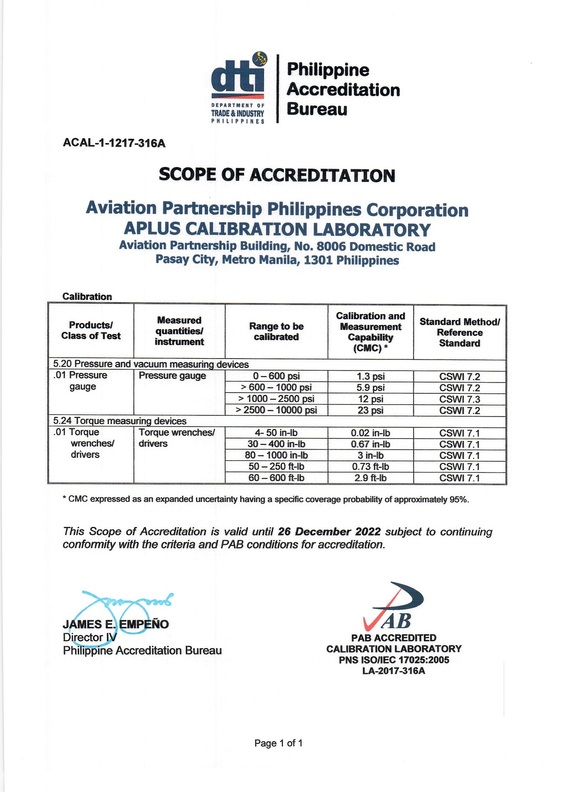 Aplus Calibration Laboratory is accredited to PNS ISO/IEC 17025:2005 ‘General requirements for the competence of testing and calibration laboratories’ with laboratory accreditation no. 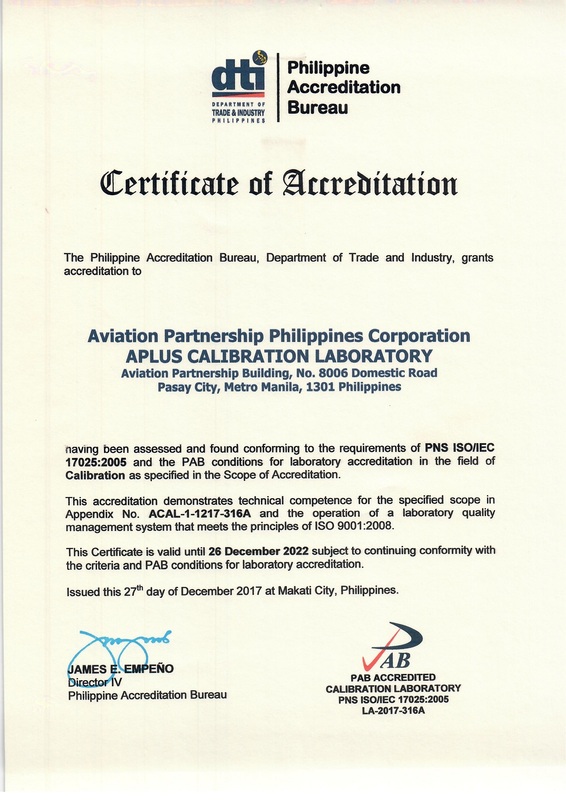 LA-2017-316A by the Philippine Accreditation Bureau, the national accreditation body of the Philippines and a member of International Laboratory Accreditation Cooperation (ILAC), Asia-Pacific Laboratory Accreditation Cooperation (APLAC) and signatory of Mutual Recognition Arrangement (MRA) for testing and calibration of APLAC and ILAC. 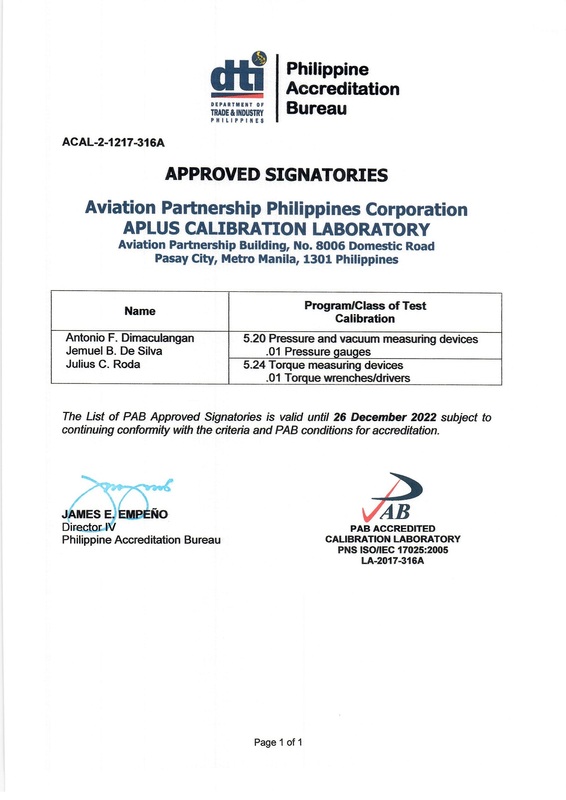 Aplus Calibration Laboratory provides accurate and reliable calibration services with a turn-around time that meet and/or exceeds customer needs and expectation. Ensures that the calibration/reference standard was traceable to National (National Metrology Laboratory – Philippines [NML-PH]) and/or International (National Metrology Institutes [NMI] of other countries such as NIST[US], PTB(GER), NPL[UK], KRISS[KOR], NMC-A*STAR[SG], etc) Standards.